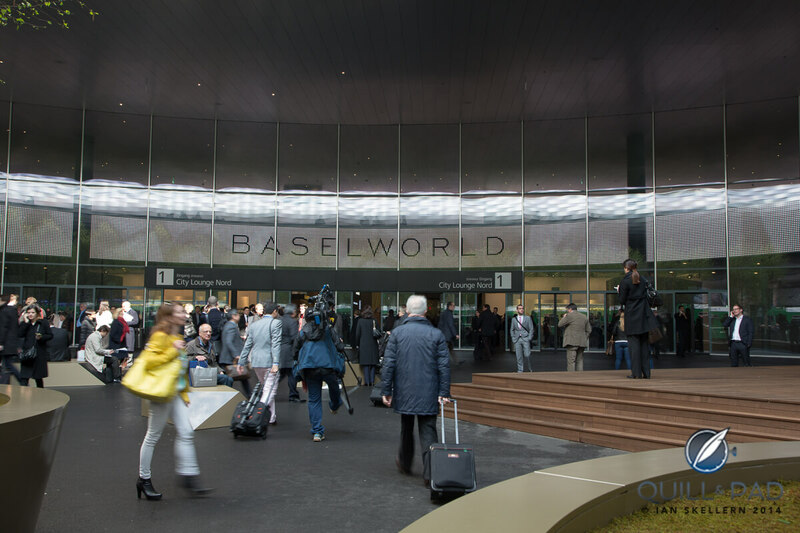 In 2015 Baselworld’s many spacious halls held 1,500 exhibiting brands. Baselworld’s management did not release exhibitor statistics for 2016 and 2017. According to an announcement released today, the upcoming 2018 edition of the show will have only 600 to 700 exhibitors with precise numbers to be released in February 2018 along with the official catalogue. Three and a half halls are due to be closed for the 2018 edition: Hall 1.2, Hall 4, Hall 5, and half of Hall 2. Baselworld has been the world’s leading watch fair for 100 years (see 1917-2017: A Brief Retrospective Of 100 Years Of Baselworld) – and in that century it has played witness to the many phases that watchmaking has gone through. In my opinion, it really has been the one thing steadfastly centered in the industry; a lot like death and taxes, Baselworld has been excruciatingly hard to get around – a position, one might argue, that the fair management has taken advantage of in recent years, perhaps even to the detriment of the industry. Does Baselworld reflect all the needs of the watch industry? The gargantuan Baselworld has apparently been unable to modify itself enough to keep pace with all the changing needs of watchmakers, buyers, and the buying public. First, an apparent lack of attention to the needs of an important part of the industry in 1991 led to Cartier heading off to create its own fair expressly aimed at the upper crust (both buyers and sellers) of watchmaking. While at the beginning the SIHH was taken less seriously than later became the case, a continuously improving understanding of what luxury brands and buyers want have seen this Geneva-based trade-only exhibition persist and grow as much as it has more or less wanted to (see Celebrating 25 Years Of SIHH). Another need – that of the many boutique brands and independent watchmakers and their very solvent collectors’ circles, a powerful and well-funded stratus of the watch-buying public – was not recognized to be quite as important as it was. In the 1980s Baselworld offered the A.H.C.I., a grouping of independent creators, many of whom make only a handful of timepiece each year, a free booth in the first years of its existence. However, neglecting to understand the powerful draw of this creative group of international artists, the show management placed the A.H.C.I. booth in out-of-the-way positions that are almost never near the other independent watchmakers of the group’s ilk. Positioning all of these indie entities together would have been a win-win for everyone. Was it too hard? Too much trouble? Who knows, but tellingly the number of independents exhibiting in the dedicated Carré des Horlogers at the SIHH continues to grow year on year with 16 now taking part in January 2018. The non-A.H.C.I. independents eventually ended up in Baselworld’s Palace (while the A.H.C.I. and other independents were oddly placed in Hall 2.0, a hodge-podge of various watch and jewelry manufacturers), a tent-like temporary structure, which very soon became a hopping draw for the well-heeled. This, too, seems to have largely gone unrecognized. In 2017 Baselworld closed the Palace, moving the majority of indies to the newly founded Les Ateliers in Hall 1.2, a very worthy solution if a little hard to find the first time. The independents at the A.H.C.I. continued on in Hall 2.0, a good 15-minute walk away from the independents at Les Ateliers. Hall 1.2 is being closed as one of three and a half halls. However, the fair management has indicated that Les Ateliers will remain as a coherent entity, though exactly where is not yet clear. The move will almost certainly necessitate the cost of new booths for the independent creators, who had just invested for the 2017 show; that’s a needlessly exorbitant expense for a small company or independent creator. It is no secret that the watch industry is at a turning point in its long history. Electronic and smart watches are attacking the lower end and mid-priced segment of the traditional watch business, while the luxury industry has been experiencing a wild downswing since 2008, with 2014 through 2016 especially bleak. These two events have surely played a larger role in affecting Baselworld’s results. Additionally, the fair underwent a major renovation between 2011 and 2013 that expanded capacity and saw a completely remodeled Hall 1, the luxurious showcase of the fair (and the industry). Five years in the planning and execution, yet completed after only 22 months of actual construction work, the renovation costing 430 million Swiss francs has recently come under fire in the press for nepotism. After the renovation, the fair management raised exhibitors’ fees by a substantial 20 percent – though to be fair, the square-meter price had not been raised since 2006; additionally, the fair created the Basel Brand Book, a mandatory-purchase object for exhibitors, which cost another 15,000 Swiss francs. For Baselworld 2018, which has now also been shortened by two days, the square-meter cost of booth space has been lowered by ten percent. Nonetheless, the damage was certainly already done. Another cause for the drop in exhibitors is also certainly further fragmentation of the traditional business model (manufacturer-distributor-retailer) due to the new appearance of local fairs, various new consumer fairs, and the tsunami of online sales outlets – which has decreased the need for traditional buyers. See Bricks And Clicks, Bricks Or Clicks, Just Clicks? There’s A Watch Retail Tsunami Coming, But How, What, When . . . And Why? for more on that subject. This news is shocking to say the least. Can Baselworld truly continue to be called “the global event” now? While you decide, perhaps remember that while the absolute number of Baselworld exhibitors in 2018 is now between 600 and 700, the brands among them represent the majority of Swiss watch exports according to fair management. Baselworld’s management is sure the “paring down” will represent better quality, but I’d like to see the new fair – and make no mistake, this will be a new place we visit in March 2018 – before I pass judgment on that. The 2018 edition will be a new interpretation of Baselworld, one that is possibly learning to finally go with more real market conditions and – above all – the times. For more information, please visit www.baselworld.com. I guess that we will all be waiting to see the numbers in 2019! Thanks as always for the great article. One issue that many industry people have always had with Baselworld is seeming disdain with which retailers and smaller vendors are treated. As a retailer, we have to pay to gain access to purchase! Why isn’t Basel transportation included in the entry ticket price? The wifi is cost prohibitive. There is so much more that could be done differently to create a positive feeling. It feels that Baselworld has not really cared about anything other than making money for a very long time and sadly, today, they are seeing the repercussions. I love the show. The passion, the buzz, the people. But it is hugely expensive, fraught with frustration, confusing and lacking a feeling of being welcomed. I hope they wake up and react quickly, before it is too late. That’s another great insight, Jeremy. I’m sorry to hear it, but it’s an aspect I hadn’t thought of. Things like wifi costs are a product of the demands of the venue, not the show. I worked on trade shows in Las Vegas for years, and you couldn’t do anything without paying a ton of money to the union help and the venue. These shows were very expensive to put on because of that. I’ve never been to Baselworld, but was thinking about going there next year. Since I don’t know anything about the experience; do you think it’s worth the time and money for a newbie like me to go there? Or is it just a place for big luxury watch brands and established journalists? Tomas, Baselworld is very daunting and big. If you’d like to handle watches and talk to executives this is not the place to go. As a newbie, you would only be looking in the windows and cases at the new watches. For a new watch person, it is perhaps possible privately organized GTGs that would be of greatest interest. Ok, thanks Elisabeth! I appreciate the advice. Yes, it’s electrifying. And even if it’s smaller, it will may be stronger. I’ve gone for 4-years as a journalist and I look foward to Baselworld every year. In all honesty, I’ve always felt it was too big. I was never able to see everything. Condensed down, I believe it will be a work of art. On my website is a video of my experience in 2017. They have also think of having the Basel world Exhibition in Asean countries where Economy is growing ! Also now electronic watches like Apple , Grameen ect. are in harts of young crowds .The Swiss Watches have not done anything on this front . I am visting Baselworld since the last 15 years and I can say that the fair has been changed from a place to make business to a PR, Get-Together place for the watch industry players. For so many, visting Basel fair became a tradition rather than a need to explore new brands and concepts in the industry. In addition to that, with the developed communication tools, connection between brands and current or potential distributors or retailers is not limited to physical face to face meeting at Basel fair, most of the deals are done outside Basel fair’s calendar. Also, many mature brands which started to consider Basel fair as a PR event ( a super costly one) are shifting their budgets into a private quality-time events for their customers where more time is allocated for better interactions and discussions; such can’t happen at Basel fair..
Arrogance and greed…see what it caused! Thanks Elizabeth, excellent article. Someone said that a camel is a horse designed by a committee, and that fits Baselworld. As a fellow journalist I attended from ’89 to the great transformation in 2013 when I realized that it was too big for my failing body. In fairness though, the organisers have to deal with the disparate egos of the major exhibitors, SIHH is controlled by a single iron hand. Thank you Elizabeth for this interesting article ! – the AHCI never joined the other independents because they didn’t want to. It’s precisely because they think they’re “Artists”, whereas they’re Artisans, that they chose not to join the others indies. But having said it’s for sure the the Baselworld fair management has never understood who is who. And they’re still not interested to understand that the watch industry is made not only of the Premier League in hall 1.0. – the jewelry exhibitors are even more affected by the lost of interest in a 19th century business model such as the Baselworld fair. Baselworld needs to understand very quickly that the exhibitions of the 19th century are no longer needed neither by the trade, nor the press or the collectors. The physical GTG’s are still useful (Apple organizes them twice a year !) but the format of Baselworld is totally outdated ! But to cut a long story short : the SSIH is not yet an alternative for Baselworld, it might be once the organization of the show will be taken away from the FHH = Richemont and a few others, and people will finally realize that Geneva has a world unique fair infrastructure. Palexpo/Geneva is in walking distance of 1. an international airport , 2. a train station , 3. a high-way , 4. has enough hotel capacities in the 4 and 5* range, which unlike Basel, doesn’t make it necessary to have people sleep on overpriced ships ! A small testimony, I exhibited for the first time in Basel in 2010, I had a stand of more than 20m2 in hall 4, for less than 15 000 € (stand included), the following years until 2014 to the Galery Watch a stand of 11m2 for always the same price with a cabin on a boat. In 2015, the organizers of the show have removed the watch galery at the palace to implement it in hall 2.2 (who knows where it is ?????). I refused and moved to the Ramada. Last year I had some hope with “les Ateliers”, unfortunately the budjet represented this time, for a stand of 20m2 (refusal of the organizers to have smaller) 30 000 € plus 15 0000 for a disposable stand , or over 50,000 budget with accommodation. Share a booth between several brands? it’s 10000 more per brand !!!!!! Here again I said no. So we went from 15000 € in 2010 to 50000 in 2017, it’s just crazy! All the little independents do the same calculation, with 50 000 euros, we can do as much collectors diners everywhere in the world that we want, with conditions much better than in Basel ….. I can tell many stories about the Exhibition, once was the most important in the world, but starting from 3 4 years ago is complitely changed, it’s turned only in a PR event, too expensive for the value of the orders done, with that money you can visit hundreds of clients all over the world and many times…! At the end you have more success it’s for that reason that in 2018 we won’t be there. I would like to go to Baselworld one day too, Big watch fan!